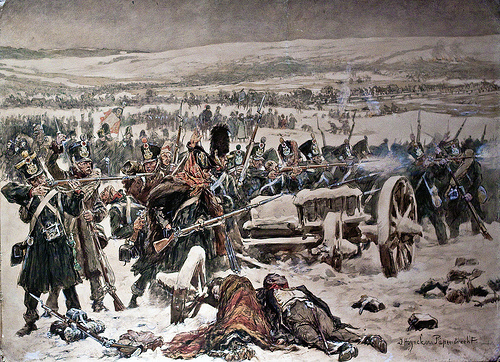 The Berezina crossing is often portrayed as the end of Napoleon’s army in Russia. This is only half-correct. It is true that an estimated thirty thousand stragglers and non-combatants failed to cross to the western side, but the actions of the rearguard formed by Victor’s IX Corps and the army’s vanguard saved the Emperor from complete destruction. That the river was bridged at all was a miracle of improvisation and leadership by General Eblé. He countermanded Napoleon’s order to destroy the pontoon train, saving two field forges and eight wagons loaded with charcoal and tools. He also instructed hi sappers to each carry a tool and fitments. 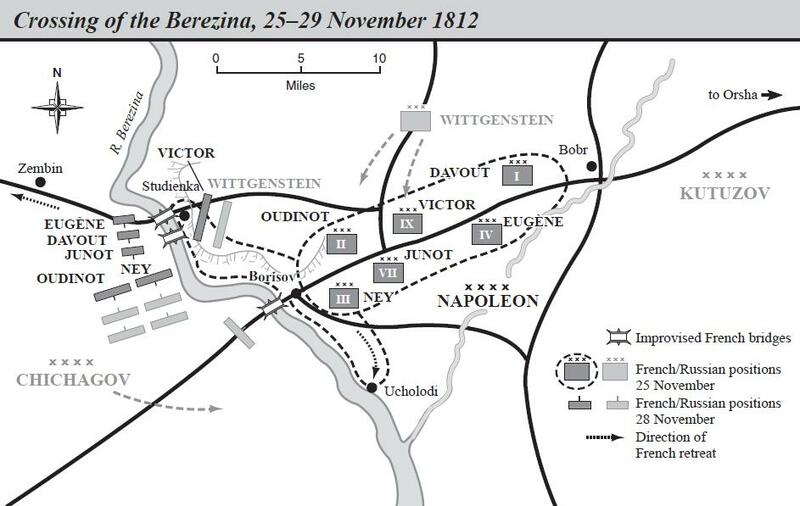 Napoleon also played his part by tricking the Russians into believing that the crossing would be elsewhere. The initial set-up. 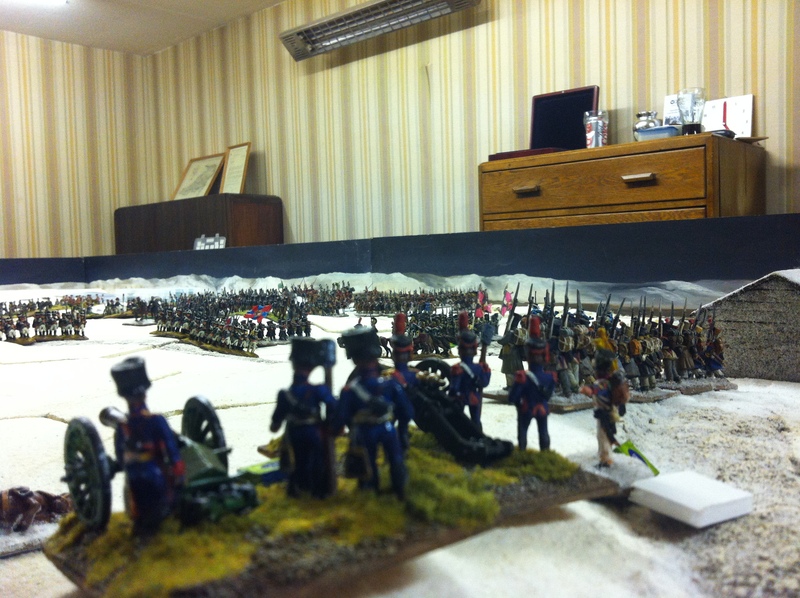 French rearguard – foreground & centre. 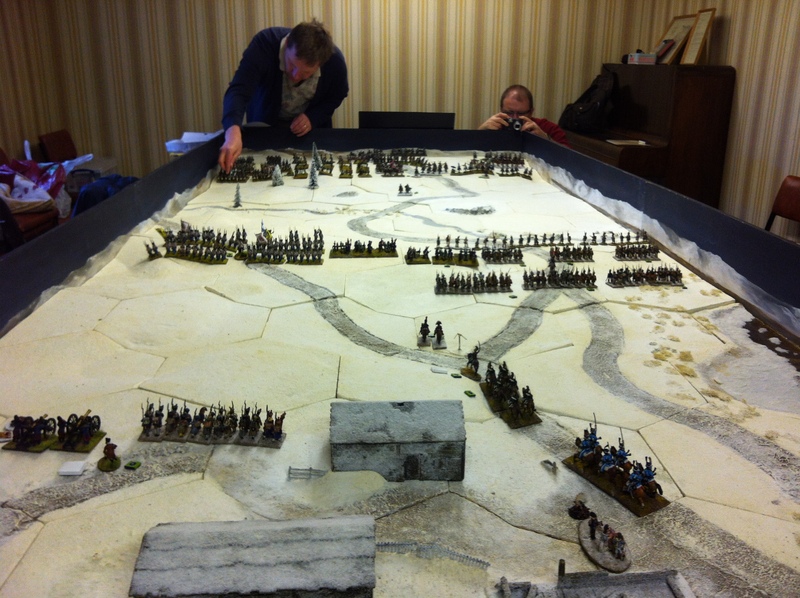 OWG refought the rearguard action on the east side of the river on 28th November. The French division of 5,000 was commanded by GD Girard, which comprised a Polish Brigade under GB Ouviller, the Baden Brigade under GB Hochberg, a small reserve of the 4/55th and four 12 pounders under an artillery officer and three depleted cavalry regiments of Baden and Berg under GB Fournier. The Russians were commanded by their Advance Guard commander, MG Vlastov, who was also in charge of a mixed force of 2,500 and 12 guns supported by an Infantry Brigade of 4,000 and 24 guns under MG Berg, a mixed force under MG Fock of 1,000 and a cavalry brigade of 600, totalling 8,000. Beginning at 1400, the French forces defended the line of difficult marshy ground in the stream valley. Vlastov’s brigade fixed the Polish brigade and its skirmish screen with a series of probing actions while the Russian artillery was brought up. After a concerted attack in the centre a Polish battery and a battalion were overurn. General of Brigade Ouvillor had no option but to order a withdrawal to a final stop line on the river bend to cover the south of Sudyanka. The pressure during the next hour mounted on the French left flank, the Baden brigadier Hochberg panicked and blundered into the enemy lines. Shortly thereafter the Baden morale collapsed and they fled the field in disgrace. 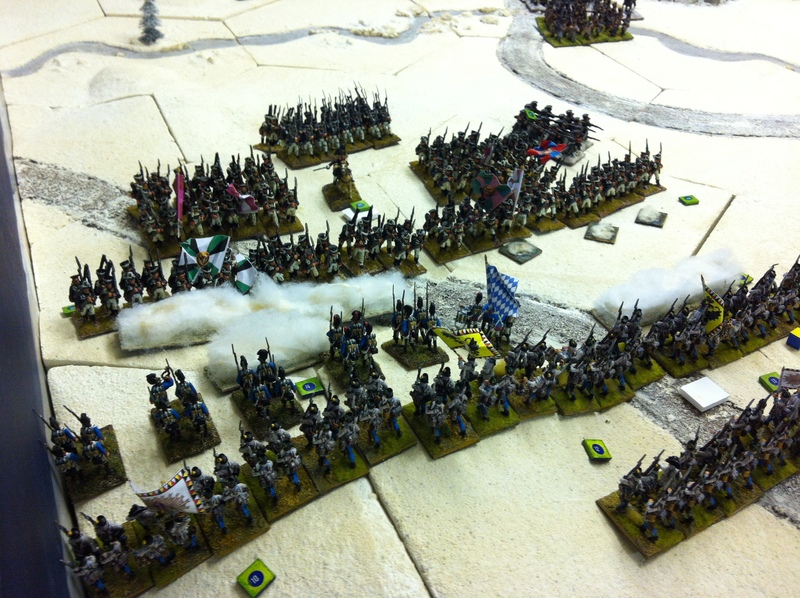 Disaster loomed for the French side but the remaining brigades stood their ground. The Russians realised that they were on the brink of victory but had to continue with their ENGAGE orders to ASSAULT. Their command suffered from casualties and unhelpful throws. Somehow the Poles managed to extricate themselves and take some of the steam out of the Russians advancing towards the bridges. Meanwhile on the right flank, the Russians came within a whisker of contact in the northern part of the village but were stopped by the 4/55th Battalion and four 12 pounders (the only French troops on the table). This was followed by two decisive charges by deftly controlled Baden/Berg cavalry. It attacked the rear and flanks of the battalions spearheading the attack. With nightfall, the Russian bid for victory was extinguished. NB: Sources differ for OB information. Our OB was based on Digby Smith’s Data Book. This involved French artillery support from the other side of the river for a limited period, which we might factor in for the next refight. We might allow Russian pioneers to bridge the stream for artillery, though the ground would still be difficult. Although the Russian artillery fire managed to panic the estimated 30,000 stragglers and non-combatants, the action fizzled out at about 1800 in an artillery duel and skirmishing. However, one similarity was that the 360 German cavalry played a vital role. In the historical battle they heroically sacrificed themselves to prevent the Russians from outflanking the French on the left of their defensive position. Losses were heavy on both sides. The Baden Brigade lost 28 dead and wounded officers and 1,100 dead and wounded men; a total of 900 remained in arms.